I’ve started a new morning routine. Setting the alarm 15 minutes earlier, I sit in front of my altar, light a candle, say good morning to spirit with a short meditation and pull an oracle card for my day. As I repeated the words softly to myself I could feel my body relax, tightness softening into expansion. Okay, I said to the voice, I’ll stay open. It feels like a big yes to the universe – an invitation to disarm defenses and poke holes in walls. 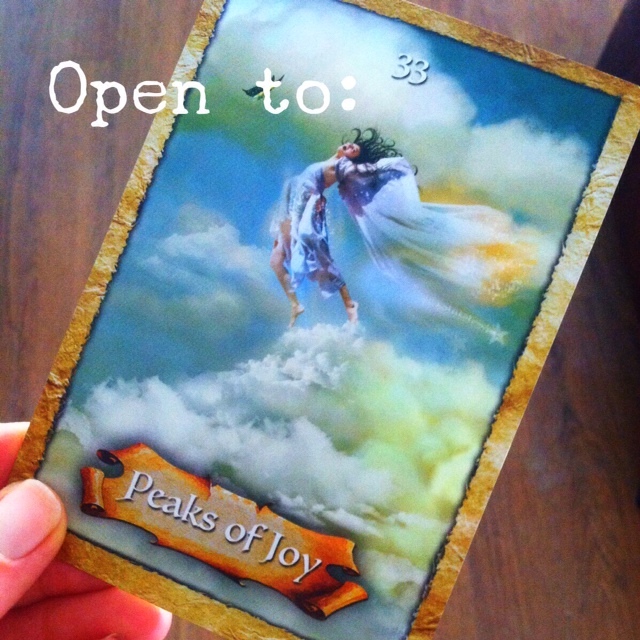 Even if joy doesn’t come often, open is a gentler way to move through my week than closed. What do you need to open to this week? Joy? Love? Anger or grief? Let that wise voice inside of you speak. (I’m quite sure it has something to say). This entry was posted in Uncategorized and tagged mantra, open, perspective. Bookmark the permalink. I think I like, for me at the moment, “peeks” of joy. It somehow releases any expectations of scope or grandeur. Rather I can side-glance and spot something that makes me feel happy: it floods in as much as “it wants to” and eases my path. As to Open, here is a quote that helps me and that I share with my students. Thank you, Alana, for reminding me of it today. Even though it was from one dancer/choreographer to another, I think it may be helpful for anyone. And because there is only one you in all time, this expression is unique. And if you block it, it will never exist through any other medium, and it will be lost. This is one of my favorites too (not surprisingly).